Once implanted, the sensor wirelessly sends data about biomarkers to an external “reader” device, allowing doctors to better monitor a patient’s progress and adjust or switch therapies. In the battle against cancer, which kills nearly 8 million people worldwide each year, doctors have in their arsenal many powerful weapons, including various forms of chemotherapy and radiation. What they lack, however, is good reconnaissance — a reliable way to obtain real-time data about how well a particular therapy is working for any given patient. 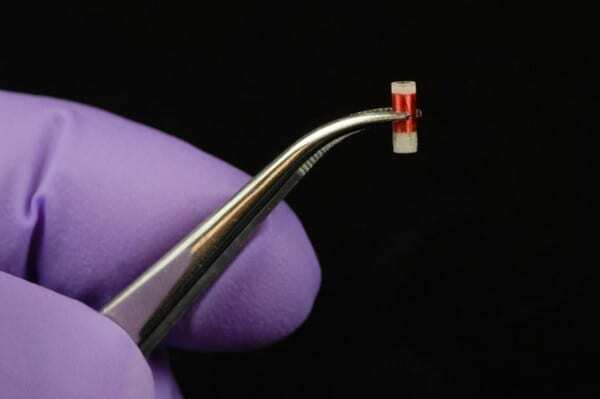 The sensor housing, made of a biocompatible plastic, is small enough to fit into the tip of a biopsy needle. It contains 10 microliters of chemical contrast agents typically used for magnetic resonance imaging (MRI) and an on-board circuit to communicate with the external reader device. For power, these new sensors rely on the reader. Specifically, there’s a metal coil inside the reader and a much smaller coil in the sensor itself. An electric current magnetizes the coil inside the reader, and that magnetic field creates a voltage in the sensor’s coil when the two coils are close together — a process called mutual inductance. The reader sends out a series of pulses, and the sensor “rings back,” as Cima puts it. The variation in this return signal over time is interpreted by a computer to which the reader is wired, revealing changes in the targeted biomarkers. March 30, 2019 - Global Biochemical Sensors Market Insight Report 2019 – Measurement Specialties, BioVision Technologies, Endress+Hauser, TE Connectivity Market Research GazetteThe global Biochemical Sensors market research report is based on the Biochemical Sensors market and extends over all particulars of the market factors. Biochemical Sensor Market is Likely to Witness huge Growth - Key Players are Honeywell, TE Connectivity, NovaSensor, AMS, Tekscan, Etc.